als Wolke aus Augen durch die Straßen und fällt wie Regen. d’yeux se déplace dans les rues et pleut comme pluie. Zoë Skoulding (born in Bradford, 1967) has lived in north Wales since 1991. She has published four collections of poetry, most recently The Museum of Disappearing Sounds (Seren, 2013), while Remains of a Future City (Seren, 2008) was long-listed for Wales Book of the Year 2009. She also translates poetry, writes literary criticism, and was the editor of the international quarterly Poetry Wales 2008-2014. She is Senior Lecturer at Bangor University. 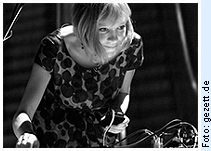 She is interested in relationships between poetry, sound and music, often performing her work in collaboration with musicians.